This review is the 2016 winner of the annual Pete Walsh Critical Writing Award by Naomi Keenan O’Shea. Click here for more information about the annual award. 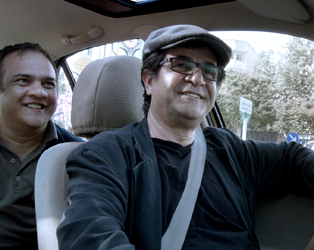 Jafar Panahi’s most recent cinematic masterpiece, Taxi (also marketed as Taxi Tehran, 2015), is another courageous foray into the realm of anti-establishment filmmaking. Restricted almost entirely throughout to a fixed camera positioned on the taxi’s dashboard, producing a head-on, medium close-up of the car’s occupants, Taxi is a formal exercise in cinematic restraint. And yet, with only rudimentary knowledge of the Iranian filmmaker’s career to date, the film becomes a work of acute creative intelligence and audacious cinematic prowess. Panahi, working under a government enforced 20-year ban on filmmaking and travel outside of Iran since 2010, has successfully evaded government censorship with his three most recent internationally distributed films; This Is Not a Film (2011), Closed Curtain (2013) and Taxi (2015). With his latest film, Panahi has dared to work outside of the privacy of his family and holiday homes, which served as the locations for This Is Not a Film and Closed Curtain, formally restricting himself to the confines of his car, while simultaneously marking a defiant step toward a more liberated and public method of undercover filmmaking. This liberation is markedly present in the tone of the film, which signifies a departure from the frustration and apathy that marks his first attempt at filming under the government ban in This Is Not a Film, as well as the profound bitterness and claustrophobic horror articulated in Closed Curtain, indicative of the ban’s stifling impact on Panahi’s work. Conversely, Taxi is brimming with vibrant humour and courageous irony alongside an agent anger that promises the burgeoning fruition of Panahi’s vehement rebuke against the Iranian government’s censorship of its indigenous film industry. It also functions as a celebratory homage to fellow renowned and revolutionary Iranian filmmaker and co-worker Abbas Kiarostami and his film’s Taste of Cherry (1997) and Ten (2002), productions that were both filmed largely within the confines of a car and provide an acute insight into contemporary Tehrani life. Stylistically, Panahi continues the trend of much of his earlier work, which has been generically characterised as docufiction, melding aspects of the cinéma vérité documentary style, with its instinct for the truth-content of fly-on-the-wall filming practices, with those of a hyper neo-realist fictional aesthetic that also strives toward a filmic depiction of reality within more stylised and mediated formal parameters and structuring. The events that unfold throughout Taxi are subtly constructed in order to expose the various aspects of Iranian life that Panahi seeks to highlight in a manner that is ostensibly of a documentary nature. His propensity for irony and self-reflexivity is heralded throughout in his extended cameo appearance as the film’s leading-man (the driver of the eponymous Tehrani taxi), and his interaction with the different occupants of his car provides a profound exposure of the lives of the diverse collection of individuals (anonymous, nonprofessional actors) that populate the film. From the film’s introductory conversation between two strangers sharing the taxi, a man and a woman, arguing over the death penalty in Iran, to the conversation between Panahi and his real-life close friend, an unnamed human rights lawyer who is also suffering government restriction in her respective line of work, Panahi engages with the daily tribulations of life within a censorious and violating society. He weaves these broader human rights issues into a narrative distinctly focussed upon the status of film (both filmmaking and film distribution) in contemporary Iranian culture; the arrival of one of Panahi’s film fanatics to the scene/screen introduces a concomitant narrative of anarchical endeavor to the central story; the Panahi-enthusiast is in fact a smuggler of pirated films that have been censored by the government, representing a micro-filmic revolutionary that is working ‘on the ground’ in Tehran to expand the distribution of banned films in the capital. Thus Panahi’s taxi becomes both a formal and physical rebuke to the country’s censorship laws as he shuttles an illegal small-time film distributor around the city carting criminal goods, including some of Panahi’s own work. It is with the introduction of Panahi’s actual niece Hana, a precocious and aspiring young filmmaker, that he makes his most direct and cutting jibe at government censorship laws. Hana, undertaking a school film project, outlines to her uncle the criteria required to produce a distributable film in Iran, most notably the eschewal of “sordid realism,” an ironic nod to the genre of realism espoused by Panahi throughout his canon of work. At one point, alone in the car, Hana turns her camera upon a young boy committing a theft on the street, and demands that he return the stolen money in order that her film not breach the criteria of the Iranian film industry’s prohibition of “sordid realism.” Panahi deconstructs these outdated censorship laws within the narrative diegesis of Taxi by presenting the potentially moralising force of realist and documentary cinema when the boy chooses to return the stolen money at Hana’s behest. The only child to enter Panahi’s taxi, Hana functions as the film’s embodiment of Iran’s regenerative youth reclaiming future control over a silenced film industry. It is with both irony and a bitter hope that Hana’s progressive role within Taxi was extended beyond the screen at the 2015 Berlinale Film Festival, where she accepted the Golden Bear Award for the film on behalf of Panahi, whose 20-year ban on travel prevented him attending the festival. It is easy to be swept up by the vigor and verve of Panahi’s Taxi, engrossed in the roller-coaster of humour and pathos of the film’s various eccentrics and freedom-fighters. The final shot of Taxi, with the car emptied of its occupants and the camera positioned toward the front window screen, produces an uncanny jolt in the viewer with the sound of a glass pane smashing, cuing the return of the dark reality underpinning the film. Panahi’s is a voice and vision reminding us that film is far from dead. In fact, film is life-giving and life-empowering. And Panahi is committed to making films that show life in all its strength and power, however oppressive the external forces governing it.